New York, February 22, 2017--The Committee to Protect Journalists today called on Hong Kong authorities to investigate the harassment of journalists at the daily Sing Pao. Sing Pao Media Enterprises, which owns the paper, released a statement yesterday saying that staff have been followed and harassed, and that the newspaper's computer system was attacked. The company statement said it believes the harassment is connected to a series of Sing Pao columns criticizing outgoing chief executive Leung Chun-ying, Hong Kong's top leader, and the Chinese government's Liaison Office, Beijing's top representative body in Hong Kong, in the run up to the chief executive election on March 26. "Journalists in Hong Kong should be able to do their jobs without fear of reprisal, particularly in these crucial days leading up to the chief executive election," said Robert Mahoney, CPJ's deputy executive director. "We call on Hong Kong authorities to thoroughly investigate this incident and prosecute those responsible for the cyberattacks against Sing Pao and the harassment of its staff." 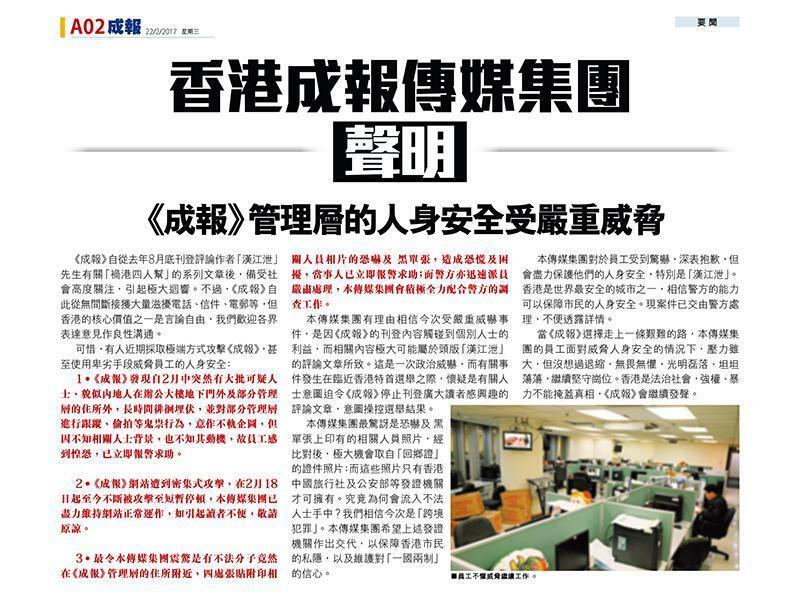 Since mid-February, a number of unidentified people have been seen outside the newspaper's office in Hong Kong or been seen following staff and taking their photos, according to the statement and an article published in Sing Pao today. The media company said that the paper's website came under digital attack and was down temporarily on February 18 and 19, and there are signs that the company's computer and email system were attacked in an attempt to steal information about the company. Flyers containing threatening language and showing a photograph of a Sing Pao manager were also posted near the employee's residence, the company said, without naming the employee. Sing Pao said that the flyer photograph appeared to be the same one used for the manager's "Home Return Permit," a document issued by Chinese police that allows Hong Kong residents to travel to the mainland. The media company said that photographs for the travel permits should be possessed only by the issuing agencies. Hong Kong police told the news website Hong Kong Free Press that the manager reported the incident to them. CPJ was not able to immediately contact Sing Pao for comment. 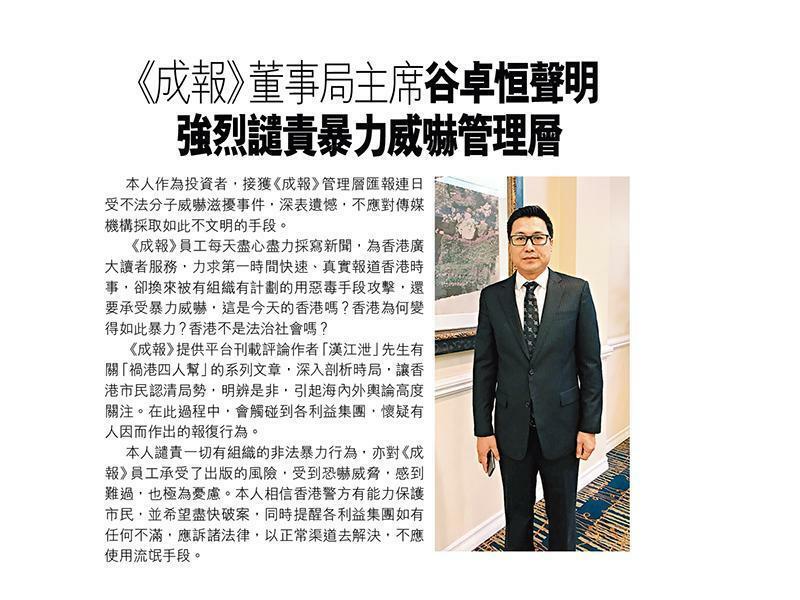 Sing Pao is known in Hong Kong as a pro-Beijing publication, but in recent months it has run anonymous commentaries denouncing Leung and the Liaison Office. In October, Chinese state news agency Xinhua reported that Gu Zhuozheng, chairman of Sing Pao Media Enterprises, was wanted by police for allegedly being involved in a corruption case on the mainland. Gu denied the accusations, and said he had been under a "revenge-driven political attack," according to news reports. Gu issued a statement yesterday condemning the threats to Sing Pao staff.